Merck Launches “Merck More Than a Mother” Championed by H.E. First Lady of Nigeria in partnership with Senate Committee of Health, Nigeria Ministry of Health,Africa Fertility Society and Future Assured foundation. “Merck More than a Mother” aims to empower infertile women by improving access to information, education, healthcare and change of culture and mind set to de-stigmatize infertility in Nigeria. Merck has launched its „More than a Mother“ campiagn during two big events in Lagos and Abuja. Lagos, Nigeria October 11, 2016 – Merck, a leading science and technology company, announced the launch of “Merck More than a Mother” campaign in Nigeria to empower infertile women by improving access to information, education, healthcare and change of culture and mind set to de-stigmatize infertility. The initiative will also empower infertile women in Nigeria who can no longer be treated socially and economically to lead independent and happier lives through “Empowering Berna” project which is part the campaign. Presiding over the launch of the campaign in Lagos Nigeria, Senator Dr. Lanre Tejuoso, the Chair of the Senate Committee of Health and who is also an ambassador of the campaign in Nigeria expressed the Senate’s appreciation of the partnership with Merck that will bring about an attitude change towards infertile women. 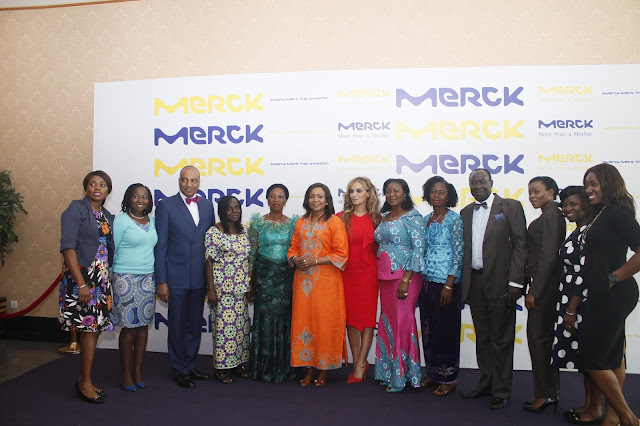 Merck more than a Mother launch in Lagos was in partnership with Senate Committee of Health, Africa Fertility Society, Association for Fertility and Reproductive Health in Nigeria and the Society of Gynaecology and Obstetrics of Nigeria. “This campaign will bring attention to the challenge of infertility that not much effort has been put to recognise. We have not seen a campaign that addresses this very sensitive issue before,” Tejuoso said. “As an ambassador for this campaign in Nigeria and the only male ambassador together with our partners I will make a difference especially in reaching out to men who have been shy to come out to talk about infertility considering that over 50% of infertility cases are due to male factors,” Senator Lanre added. “Above all, I am personally working on the ART bill to sponsor it in the parliament to regulate ART and fertility care in the country,” he emphasized. “Merck More than a Mother” campaign is a great initiative to empower an unprivileged category of women in Africa, women who suffer infertility. They have been neglected, mistreated and discriminated because they cannot bear a child. The campaign will empower infertile women in Africa through improving access to information, awareness, health and change of mind-set,” said Rasha Kelej, Chief Social Officer, Merck Healthcare. During the launch, a panel of fertility experts, policy makers, and academia discussed the need for creating awareness about infertility prevention, management and male infertility; building advocacy for the development of artificial reproductive therapy (ART) laws; improving access to fertility care by integrating fertility care into public reproductive health services and building the capacity to provide quality and safe fertility care through the training of African embryologists. The launch also advocated for developing and enforcing policies to protect women from being disinherited as a result of childlessness. The panel included Senator Dr. Lanre Tejuoso, the Chairman Senate Committee of Health of Nigeria; Hon. Joyce Lay, Member of Parliament, Kenya; Dr. Joe Leigh Simpson, former President of International Federation of Fertility Societies (IFFS), Dr. Richard H. Reindollar , Chief Executive Officer of ASRM, Dr. Faye Iketubosin, President Nigeria Reproductive and Fertility Society; Yiannis Vlontos, Head of Intercontinental Region, Merck; Prof. Oladapo Ashiru, President of Africa Fertility Society; Dr. James Olobo-Lalobo, Vice-President of Africa Fertility Society, Uganda; Prof. Brian Adinma, President, SOGON; Dr. Chris Agboghoroma, Secretary General, SOGON; Dr. Ibrahim Wada, Chairman of Garki General Hospital and Vice Chair of Nisa Fertility Hospital, Nigeria , and Dr. Rasha Kelej, Chief Social Officer, Merck Healthcare. “No woman deserves to go through violence for being unable to bear a child. People need to come out and speak about infertility and create awareness that a woman is more than a mother,” said Hon Joyce Lay, Member of Parliament and “Merck More than a Mother” ambassador for Kenya. “We need a multi-sectoral approach to address infertility. Policy makers need to support budget allocation for establishing fertility clinics, and for research and training of specialists,” said Prof Ashiru, President of Africa Fertility Society. “Infertility has now been recognised by the World Health Organisation as a human rights issue. Every man and woman has a right to available interventions to have a child,” said Prof. Joe Leigh Simpson former President of International Federation of Fertility Societies (IFFS). “In order to build capacity to provide quality and safe fertility care Merck has joined hands with Indonesian fertility experts to provide advanced embryology training starting with Kenya and Uganda. The next countries will be Nigeria and Ivory Coast and will expand to the rest of Africa” Rasha Kelej, Chief Officer of Merck healthcare emphasized. ASRM (American Society for Reproductive Medicine) will join hands with Merck more than a Mother to provide combined theoretical and practical training course for Africa embryologists” said Dr. Richard H. Reindollar , Chief Executive Officer of ASRM. Speaking at the launch Yiannis Vlontzos, Head of Intercontinental Region, and Merck emphasised Merck’s support of the “Merck More than a Mother” campaign. “This campaign is adding value by engaging with patients, families and communities. We are working for their well-being and that is what Merck is here for,” he said. Nkemdili Okeke (not real name) is a secondary school certificate holder who got married in 2011 at the age of 25, to a wealthy businessman in the South-East Nigeria. Five years into their marriage, she did not conceive and was subjected to dehumanising treatments by her husband’s family. Nkemdili’s mother-in-law would abuse her constantly – calling her all sorts of names, and even accusing her of being a witch that eats up the babies in her womb. At other times, Nkemdili’s mother-in-law accused her of ruining her womb, saying she had been into prostitution and had destroyed her womb through incessant abortions. This went on and on for years, to the point where Nkemdili’s husband became pressurised by the mother to get a second wife for himself. The claims were that Nkemdili was to be blamed for her inability to conceive. However, on the advice of a neighbour, Nkemdili and her husband, sought medical attention, and lo and behold, it was discovered that it had not all been Nkemdili’s fault but her husband’s, as he was diagnosed to have a watery and low sperm count, thus suffering from infertility. All Merck Press Releases are distributed by email at the same time they become available on the Merck Website. Please go to www.merckgroup.com/subscribe to register online, change your selection or discontinue this service. Merck is a leading science and technology company in healthcare, life science and performance materials. Around 40,000 employees work to further develop technologies that improve and enhance life – from biopharmaceutical therapies to treat cancer or multiple sclerosis, cutting-edge systems for scientific research and production, to liquid crystals for smartphones and LCD televisions. In 2014, Merck generated sales of € 11.3 billion in 66 countries. Founded in 1668, Merck is the world’s oldest pharmaceutical and chemical company. The founding family remains the majority owner of the publicly listed corporate group. Merck, Darmstadt, Germany holds the global rights to the Merck name and brand. The only exceptions are the United States and Canada, where the company operates as EMD Serono, EMD Millipore and EMD Performance Materials.